There are elements to the ongoing conflict between North Korea and US/South Korea. It's difficult to tell what the players are doing without a program. It's almost as difficult with a program, but I'll throw my cracker in the soup once again. Russia enjoys seeing the US trying to unwind the North Korean Gordian Knot, while China takes a more clinical approach to the issue. Both plan to remain in the bleachers and criticize the US. One 'F-You' that the US could do to both China and Russia would be to sell nuclear weapons to Japan. They'd be very unhappy about that, as some of you readers have suggested. It might look like an aircraft carrier but it's s destroyer. I'm still not sure that the Japanese public would applaud that turn of events. 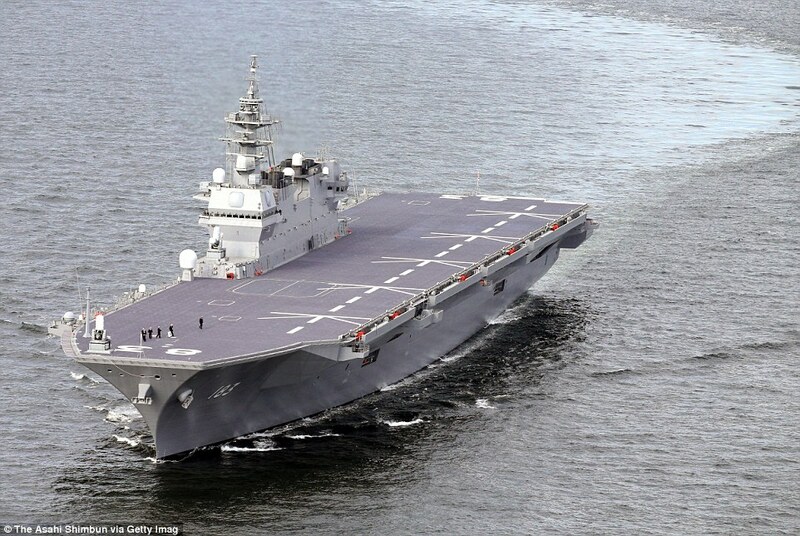 It's difficult enough for the Japanese leadership to build aircraft carriers and call them "destroyers". China's hegemony is not confined to the mainland. It wants Japan to toe the line as well and at least at present, the Japs are disinclined to be absorbed into the NEW Chinese "Greater Asia Co-Prosperity Sphere". Japan has taken its self defense obligations seriously and while there are those in the US who have been critical of their efforts, I have not been. At the 11 July daily press session, Foreign Ministry spokesman Geng Shuang replied to a question about China’s role in controlling North Korea. Geng said that China’s role is indispensable in solving the problem, but insisted that China has done its part, implying that other parties have not. Geng engaged in a short rant. The salient inference from the past six months of Chinese interaction with the US and North Korea is that most of what North Korea has done does not threaten Chinese interests. The Chinese leaders see risk in instability, not necessarily a threat. Their diplomacy, negotiating tactics and preoccupation with stability suggest they are continuously engaged in risk management, a lot like financial managers...which is very "Chinese" in its approach. 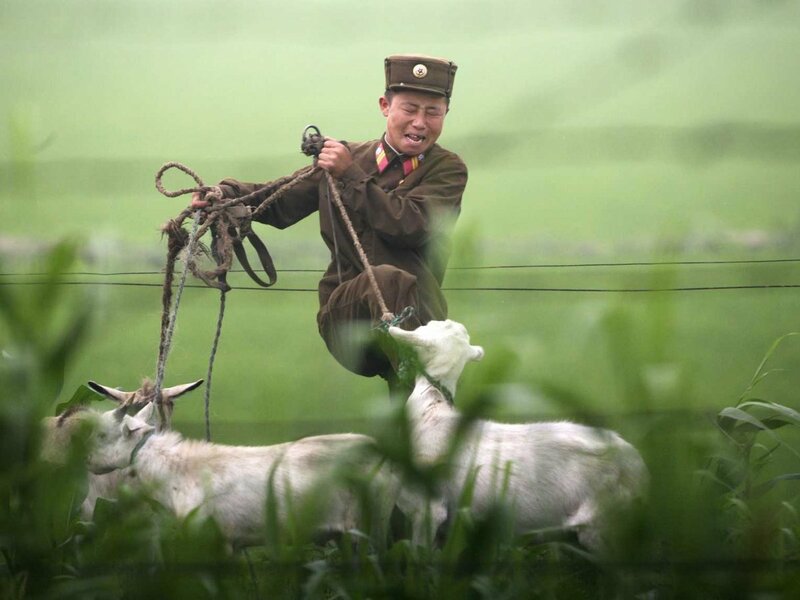 The People’s Liberation Army’s (PLA) actions, however, are about threats. During the period when tension peaked between 18 and 20 April, we received two reports of significant PLA movements, and activity just before the Chinese delivered their ultimatum to North Korea to not detonate a sixth nuclear device. The week of April 18th was the only time we are confident that the Chinese took unilateral action to modify North Korea behavior. Geng made another point that the Chinese leaders consider important. The instability on the Korean Peninsula is not directed against China. It is the result of unfinished business from the Korean War and the Chinese leaders do not consider it their business. Their actions, especially since the 4 July missile flight, indicate Chinese leaders have concluded that they can live with the present situation indefinitely, provided it does not lead to war. They would blame a war on the contradiction between North Korea and the US, meaning they expect the US to start it. North Korean missile launches, whose targets would be US forces and territory, do not cross China’s red lines for greater intervention. The communist mandarins in Beijing are more concerned about US reactions, than North Korean provocations. In any event, North Korea is not China’s responsibility, according to Geng Shuang. Don't expect China to do anything meaningful until one of the Nork missiles goes out of control and hits something in China. The first question to ask is whether or not Russia is cheating with the Norks. In a way they are in the oldest profession sense, because they supply high-end Russian hookers to the Nork elite, and have been doing that for decades. Sometimes the Russians sell the prostitutes as being 'Swedes'. The obvious question is whether or not the hookers are access agents (spies) that use their art to squeeze secrets from horny Nork generals. I'll let you, the readers, work that one out. 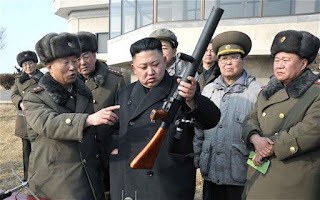 Trying to teach Dear Leader to use a machine gun. South Korean news services reported that Russia shipped $2.3 million worth of oil products to North Korea between January and April 2017. They reported this amount represented a 200 percent increase. This report implies Russia is profiteering from the sanctions against North Korea. That charge does not seem supported. First, oil sales are not banned by UN sanctions. Secondly, some of the numbers don’t add up to exploitation. At the per barrel price of Brent crude on 10 July, $2.3 million could purchase a bit under 50,000 barrels of crude for the four months. At a conversion rate of 7.1 bbls to the ton, North Korea imported a little over 7,000 tons in that third of a year. The report does not mention crude, but specialty oil products would be more expensive per ton or barrel, so the volume would be less. It is not clear from those numbers that North Korea increased its dependence on imports from Russia. Oil product imports from Russia in the range of 10,000 barrels per month are consistent with North Korea’s historic practice of importing specialty oil products from Russia, primarily aviation fuels. North Korea also has a practice of importing Russian crude for refining at its east coast refinery and returning the refined products to the Russians, retaining a portion as payment. North Korea can use cutouts, such as companies in Singapore, to bypass sanctions restrictions. Singapore is an important oil refining center, but its use as a cutout for North Korea is not confirmed in open sources.